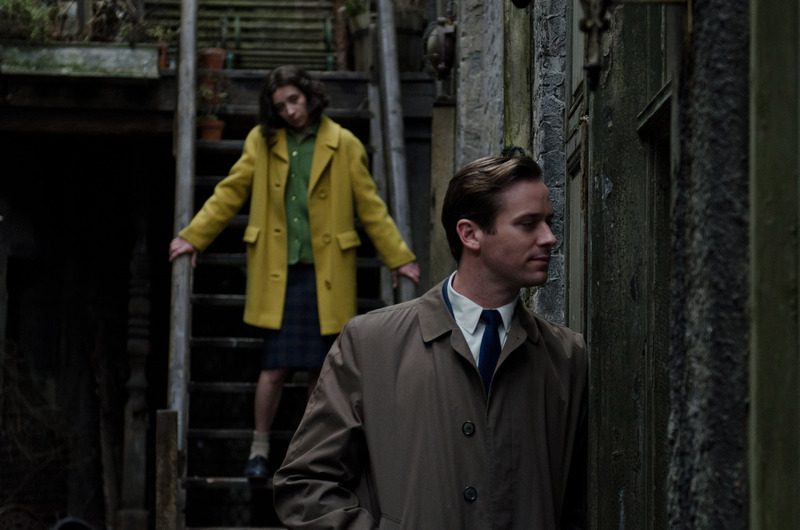 (l-r) Sylvie Testud as Annette Giacometti and Armie Hammer as James Lord in FINAL PORTRAIT. ©Sony Pictures. Cr: Parisa Taghizadeh. Dressed casually for an interview, the towering Hammer spoke about working alongside Rush and making this remarkable ode to the indefinite process of making art. Q: After your performance in the acclaimed “Call Me By Your Name,” why did you want to play this role in this film? Hammer: This was a great opportunity because James Lord is such a fascinating character. And he was such a prolific writer whether it’d be his fictional works or non-fictional works or even his correspondences. I had all of the original letters that he sent back and forth between him and his mother. I had his journals, all that stuff. So, there was a wealth of information that we could draw on to play James Lord. It’s a great character. Q: There was so much about Lord’s life where you could almost do a separate movie just about him. He had his own thing going on during this time and yet he made this time and allowed himself to be the subject for 19 sittings. From what you gleaned from your research, what was it that motivated him to just kind of stick it out with you just so whenever with this painter that he really wanted to do this? Hammer: It’s a huge honor when an artist of this sort of reputation and fame and notoriety of Giacometti asks to paint you. Because it is a huge time commitment for the artist. And they don’t paint people that they’re not interested by. There are people all the time, whether it’d be royalty or socialites or whatever, who want to be painted by these artists. Artists have had muses from way back. They say, “I think you are so interesting that I want to spend this much time just staring at you.” And if they don’t think that you’re interesting or worthy of being painted, they won’t paint you. So, the fact that Giacometti even said to Lord, “I want to paint you,” is a huge honor. We don’t get that so much now because we’re in the era of the selfie, where it takes two seconds to get a quick picture. Boom, done. But this was a serious time commitment for these people. The fact that James Lord was deemed worthy by Giacometti to be painted, he would have done anything in the world for him, especially as an American who’s living in that post-World War II artistic renaissance in Europe. Q: There was the constant cutting back to your close-up and the interaction between the close-up and the painting in this film. What kind of directions did you receive from Stanley Tucci? Hammer: Stanley Tucci who directed the film and John Mathieson, the Academy Award winning DP (director of photography), were able to use the camera as the eye of Giacometti. As he was painting James Lord, there would be moments where he would really sort of inspect his face and his visage to make sure that he could paint it and get it. So, using the camera, it forces the audience to do the exact same thing. There was a lot of conversation between Stanley and I of the fact of sitting for a portrait. You cannot move. So, how do we walk that fine razor’s edge of not being able to move, but also the audience understanding what you are going through and emoting in some way so that the audience feels what you are going through? It was a challenge and it was one of the reasons why I took on this role. More than 60 percent of the movie is me sitting completely still. So how do you make that not boring? Q: Every time your character makes a phone call to change his plane reservations, there’s a tone in your voice that it’s getting to be a bit much, but still it’s still such an honor. How do you move the audience through those 19 days? Hammer: Ninety percent of all communication is non-verbal anyway. You pick up body language; you pick up little movements. So, we would just kind of focus on those little things to take the audience along on the journey. Q: Do you see some parallels between this corporate process and filmmaking in a way because you’re doing take after take, sometimes? Does it depends on the director and the situation? The film doesn’t so much wrap up as it simply stops. Like any piece of art, it’s never really finished, right? Q: You just have to stop at some point whether it’s writing or painting. Hammer: That’s what I loved about this film is it allowed me to see the ubiquity of the artistic process. And the fact that everyone who works in a creative medium, whatever it is, whether it’d be writing or film or painting. Whatever your medium is, there is that artistic process. Something exists in your head and you are trying to get it out in one way or another and it never feels like you’re done. As an actor, it’s a little bit different because there is a sense of finality to it because the second a director says “cut” on the last day, you’re done. You don’t get to act anymore on this project. So, at a certain point, the studio is going to take this from you so the filmmaker as to quit messing with it so it can be release and shown to audiences. As an actor, though, when they say the day’s shooting is over, you’re kind of like, “Ugh, I wish I would have done.” Every artist goes through their process. The way it manifests itself in Giacometti is he would hit that point and go, “I hate this,” and destroy the painting. You can’t really do that as an actor. You can stop a take if you want, but that never really makes anybody happy. Q: What can you say about working with Geoffrey Rush? Almost every day, we would do that. And then on the weekends, 9:00 a.m. on Saturday my phone would ring. 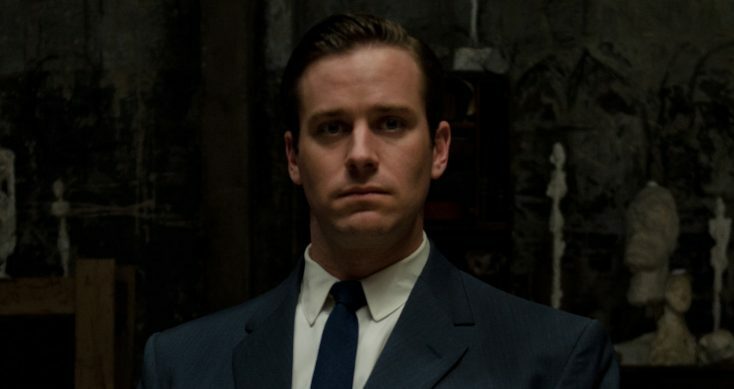 “Armie, it’s Geoffrey. What are you doing today?” It’s like, “It’s Saturday. I’m not doing anything. I’m relaxing.” “Why don’t you come by my place?” I go, “Okay.” And you show up and you sit there for seven or eight hours while he would go over everything. And it was amazing to see someone who is of that level talent still putting that much work and effort into it and it’s really refreshing. Q: What are some of the films that influenced you as a child that made you want to be an actor? Hammer: I grew up on a small island in the Caribbean (the Cayman Islands). So, for me, like sitting in a theater and then being taken to somewhere else whether it’d be the deck of the Titanic or Mars or the wild west or whatever it was. It just it was such a transportive magical experience to sit and watch a film and I just thought, “That is special. There’s something amazing in that.” And I still feel that same way. I still have the same love for film. I try to watch a movie every day. I love film. I just love watching movies. Q: You say you want to watch movie as much as possible, but you’re a married father of two. What movie you want to watch with your kids? Hammer: The last movie I watched with my kids was “Coco.” We watched that two nights ago. I’m excited about giving my kids a film education. When they get old enough and they can appreciate and sit through film, I’ve got tons of stuff I want to show them. My kids will know a lot about film just by osmosis. My love of film will hopefully translate.